We’ve known that for, what, like 150 years or something? In the past quarter-century or so, as educated (mostly, but not entirely white) professionals moved back to neighborhoods that had populations that didn’t always resemble them — in race or class or culture or all and more — there were natural clashes. Exclusion — Sometimes new residents try to recreate a neighborhood in their own image, without an understanding or an appreciation of the past. (I live in Fishtown, a neighborhood in Philadelphia that didn’t really suffer the kind of white flight, crime and urban decay of many other neighborhoods in the city, so you can be damn sure there is frustration from longtime residents who feel they’re being told their relatively successful community needs to be re-made. There’s a fine line between, say, including the community in creating the Sustainable 19125 initiative and, perhaps, plopping a restaurant down too boldly). Xenophobia — Often from more native residents, it’s that inclination opposed to the outside and any change that relates to it. If you have a recognizable clutch of neighbors and places and rules, as they change, we can all feel threatened. Ignorance — I think this tends to be the default category and both new and old residents fall into this trap. This is where many of us categorize a lot of the senseless violence, petty mistreatment and other behavior. This is a motivation of senselessness, of not understanding the broader ramifications of what we do, of not communicating or understanding each other. That during a snowstorm, you only park your car in the spot you dug out and that’s important to one neighbor or that, yes, recycling is really important to the other. I hear from a lot of friends who are new residents to neighborhoods in Philadelphia and other cities talk about how they are in communities where their more native counterparts hate them. That gets chocked up into the ‘ignorance’ category, or maybe sometimes the xenophobia, or perhaps both. I think for a lot of people, there’s greater nuance there. It may be an obvious point here, but I was sent an email from a friend after rooting around the archives of Temple University’s capstone journalism course, and she said something I thought was provocative. I think I’ve pinpointed something that may seem obvious, but I’ve been overlooking. 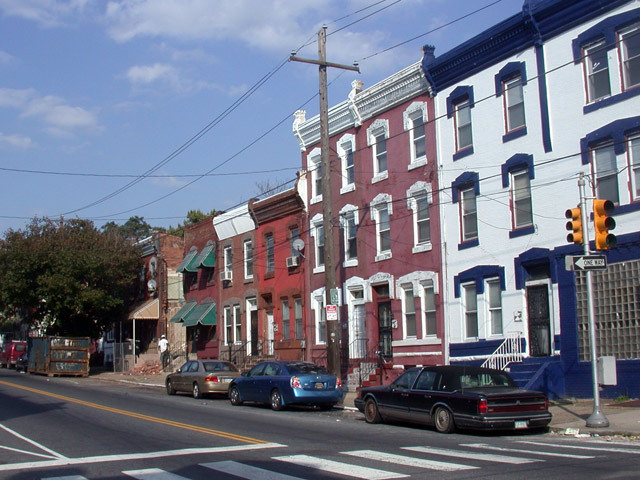 For the natives in the neighborhood, they’re not necessarily against gentrification and change. It just goes back to the same old perception of things being easier for certain people — in this, and most, cases — educated white people. Neighbors don’t hate what gentrifiers are doing, they hate that the gentrifiers can do it, and don’t understand why they can’t do these things themselves. Mostly because, as illustrated in the quote about needing more national chains in Kensington, native residents don’t understand the problem so they can’t make the correct steps to fix it. They assume that the new businesses and residents coming in are somehow working their way around a system because gentrifiers are perceived as having certain privileges. In most cases, few people actually hate that you fixed up your rowhome or opened that store on the avenue. Those who take issue may just be frustrated that you were able to do it when they couldn’t. That’s something we can all understand. I believe I work really hard, and I enjoy using some of the compensation of that work to make improvements on my home, something that ultimately benefits all of those who live near me. But, while most of my neighbors appreciate it wildly, not all do. Even if I work hard, I inevitable, of course, have been gifted amazing privilege and remarkable good fortune. So — certainly unfairly but perhaps a bit more understandable than unchecked hate or the ignorance and xenophobia that time should help quell — a neighbor who doesn’t seem to appreciate what I quietly do to my home (say, replace a ragged front door that has street value to everyone on the block) may well be motivated by a sense of confusion. Why do I, a young, privileged resident new to the neighborhood get to improve my home in a way that a particular neighbor can’t (either because of money or energy or other obstacles)? So which way is your neighborhood trending? Maybe that’d help shape your opinion. Ultimately, cities work and are beautiful because of their density (and, often, authenticity through their generational roots). They force us to interact. To have human experiences with each other, to trust and grow and learn and develop communities — a concept that is thousands of years in the making. Ultimately, a little understanding and a lot of communication goes a long way.